Worldwide cabbage is recognized for its highly nutritive attributes and for this reason it has become a major part of several meals. The last decade has seen the popularity of cabbage in Nigeria rise exponentially, prior to this time, it was majorly considered as a component of affluent people’s food. Nevertheless cabbage farming in Nigeria, unlike the rest of the world, is quite on the low with several individuals scared of indulging in cabbage farming due to several reasons. A paramount reason for the low indulgence in cabbage farming is the idea that the weather of most cities in Nigeria will prevent the crop from thriving well, thus causing the farmer to loss rather than gain. In recent times however, a group of resilient farmers rising up all around the country have worked to prove this notion wrong by successfully indulging in cabbage farming. Farmers in both the South-West and South-East have carried out experimental programs, seeking the best way to cultivate cabbage for optimal yield and their efforts have proven that indeed cabbage can be planted anywhere in the country without the fear of poor yield, as long as proper farming practices are adhered to. Before going further in this article, it is imperative to explain howbeit in a bit of detail what cabbage is, rather than assume everyone is abreast of this information. Cabbage is a foliaceous vegetable of the plant family, Brassica oleracea; by foliaceous I mean leafy. It is majorly grown or cultivated for the consumption of the stem or leaves. It is noticed that humans are mostly attracted to eating the stem, also known as head, while the leaves are used for several other purposes. The leaves even though seldom consumed by some people are mostly given to herbivores (sheep, goats, cows, rabbits, etc.) as food or used to form compost manure, for those who have no need of these, they mostly just dispose the leaves. 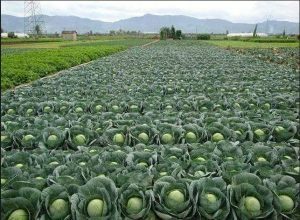 Studies have shown that the cabbage crop thrives better in cold weathers, with a moist environment. Temperatures of between 55 – 60F are known to best suit the common species of cabbage, however some species are known to thrive under lower temperatures of about 20 – 25F. Cabbage farming is gradually becoming a major source of income in Nigeria as it has been as one of the most profitable forms of vegetables to cultivate. The crop has become increasingly popular because it is one of the major ingredients used in the preparation of salad which is one of the major meals consumed especially during festive seasons in the country. Cabbage can be consumed in several other ways, it can be steamed, fried, eaten in pottage, used for food decoration, among other several tantalizing options. Cabbage is known to contain a healthy amount of calcium which is very important in humans for the development of strong bones and teeth, for this purpose it is also used in feeding snails to help develop strong shells. If you have come this far reading this article my guess is that you are seeking knowledge on how to start a cabbage farm of your own. This article promises to provide you with adequate information relevant to this topic, please join me on this journey. Before planting ensure you choose a piece of land which is sandy-loam in nature and which is well enriched with organic content. Ensure that you plant when the weather is most favorable for the crop to thrive. Since you already know that the crop thrives in cool and moist weather, then it becomes evident that the best weather for this in Nigeria will be the rainy season. Before planting on the main farm, it is advised to first plant them in a nursery. When they have matured to a certain stage you can then transplant them on the farmland. Take time to seek out good and efficient seed variety to ensure that your farming yields great results. For cabbage farming, the seeds could make or mar your farming experience. It is also advised that to obtain optimal yield, quick maturing cabbage and pest and disease resistant variety you should choose a hybrid cabbage. This will definitely yield better results for your farming experience. Ensure you apply fertilizers, most preferably organic fertilizers, at every stage in the cultivation of the crop. Be sure to harvest early enough to prevent botching or yellowing of the leaves. Even though a land consisting majorly of sandy-loam is mostly recommended, you should know that cabbage can grow on any soil. Sandy-loam however brings about optimal performance in the crop so it is most preferable. Once you have made your choice of land and it has been acquired, the next step is ensure the land is properly cleared of all weeds and shrubs. You can decide to fumigate the land with pesticides to ward off any forms of pesticides too. Following this, you should plough the land to loosen the top soil, this operation can be carried out with a shovel or hoe if it is a small land. If the land is quite large, you might require a tractor and a plough, and depending on the hardness of the soil, the land can be ploughed once to thrice. On the final stage of ploughing you can add some animal or inorganic manure to the soil simultaneously, this will help prepare the soil for planting. Finally you should prepare the seed beds for the planting of the cabbage, while doing this you can add some manure as well. When planting it is important to religiously follow the steps to ensure that you achieve optimal results. Firstly you should dig a hole of about two to three centimeters deep, following this insert about two cabbage seeds then cover the hole lightly. It is advised that this initial planting be done in nursery bags, rubbers or sack bags. This is necessary to raise the cabbage seedlings and help them grow within a properly controlled environment. After the first three to four weeks of the planting they can be transplanted to the main farmland. At this point of transplanting they should have attained a height of between 14 and 16 centimeters and should have developed between four to five leaves. It is important that you get the spacing between each plant right so they do not get choked, give a space of about 45 centimeters between each plant, while the rows should be about 45 – 60 centimeters apart. The spacing may also depend largely on the variety of cabbage being cultivated. Take note that early cabbage takes about 50-70 days, while mid-season cabbage takes 70-90 days, and late season takes 90-125 days. Since a moist soil is one of the major requirements of the soil used in planting cabbage, make sure that prior to planting the cabbage you should have properly wet the seed beds. The transplanting of the seedlings is best done in the evening period to keep them from the scotch of the sun or heat shock. Ensure that the soil pH should be between 6.5 – 7.5 for optimal results. Depending on the season which the cabbage is planted, constant irrigation of the farm area might be required. Studies show that for optimal production cabbage plants need a minimum of about 3.8cm of water weekly. The best form of irrigation for the farming of cabbage is drip irrigation. You should know that cabbage can hardly withstand a drought so it is very important that you provide enough water for the plant when there is a shortage of rainfall or a total lack of it. Mulching helps to keep the soil moist and prevent excess loss of water, especially in periods of intense heat which can lead to rapid evaporation of soil water. Ensure that you use compost to mulch the farm from time to time to prevent excessive water loss which could lead to poor yield of the cabbage. Cabbage is known to consume a lot of nutrients during maturing stages, it is mostly likened to onions and garden eggs in nutrient consumption. For this reason, it is important that you constantly refresh the nutrient content of the soil by carefully applying manure or fertilizer at each stage of the development of the cabbage plant. At the initial stage, when preparing the seed beds before planting, ensure that you apply the manure heavily, after this when transplanting you should also apply manure. You should ensure this is done recurrently over the different development stages of the crop. Towards the later development stages of the vegetable, once they start to develop heads, the kind of manure required is one which is rich in potassium. This helps to keep the leaves in color as well as help the stems develop properly. The most common pests that attack cabbage plants are cabbage white, flea beetles, maggots, imported cabbage worms, loopers etc. On the other hand, the most common diseases that affect cabbage include, Fusarium yellows, club root, black speck, rot; fungal disease that builds in the soil. The major way to combat these is to plant resistant varieties, mostly hybrid species. It is also advised to practice crop rotation as well as mixed cropping. Another major issue that affects cabbage farms is splitting. This could occur following a heavy down pour or when irrigation is done immediately after serious stress from drought. To salvage the situation it is advised to cut some of the roots from one side about 25cm into the soil from the base of the plant using a spade. Another major cause of splitting is poor spacing of the plants, to avoid this it is advised to follow the spacing specifications stated above. The varieties of cabbage are divided into three major classes, early season varieties, mid-season varieties and the late season varieties. Asides these we have hybrid varieties which are seen to be more important, some of them include, Thai cabbage, F1 cabbage from Technism etc. These hybrid species are known to be able to withstand disease invasion and pest attacks, they also grow to maturity faster, probably within two months of cultivation. It advised that cabbage is harvested once it reaches full maturity to ensure that it stays long in storage, maturation period is between two and five months, depending on the variety planted. You should attempt harvesting when the heads are fully matured and firm, or when the heads are closed and the leaves are wrapped around them and are in good shape. You are advised to use a knife to cut the head from the base of the plant, leaving about 3 leaves that will act as protection for the head from bruises or abrasions of any sort. After harvesting make sure to wash the cabbage and inspect to remove any insects before storing them. You can locate any market in your locality to sell to market men and women who will in turn sell to their customers. You can also seek out supermarkets, salad shops, restaurants, hotels, etc. that will need cabbage. It is quite easy to indulge in. There is a very high demand for cabbage in the Nigerian market. It is highly profitable and lucrative. I am sure this article has been helpful in providing you substantial information about cabbage farming in Nigeria. It is truly a gold mine that is waiting to be explored. The article above was help full. I am interested in cabbage farming and what will it cost me to start up with one acre of land. And I need a detailed business plan to enable sort for the loan.